A few weeks ago, I wrote a post called “Half-Assed Runner” – and of course I was talking about myself. Well some time has gone by and I’ve participated in a few races and now I think I might almost be a little more than half-assed runner. I didn’t really think it mattered if I ran a faster mile and it never even occurred to me to try to run a negative split on a longer run. I thought compression socks and taping up your knees was meant for a kind of special attention. 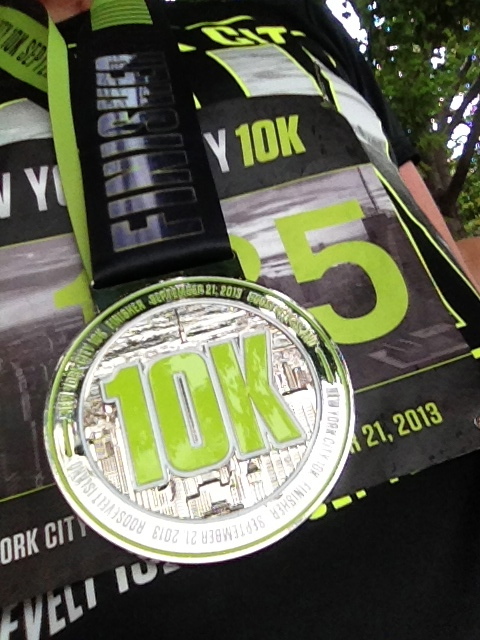 But the more longer races I run (5ks no longer count at this point), the more competitive I get – with myself. I’m getting more serious about how I run a race. While I start a race the same way – with merely an intent to finish, get some food at the end, and maybe a medal, my attitude now changes as I progress along the route. My internal monologue at the start of a race is simple – just thinking about getting my pace set, perhaps a little slower than my usual pace when I run my usual loop at the park. I start out a little annoyed because the course is congested and I need to do some weaving and find my place. I need to find my comfort zone. As I reach about the halfway point, physically I find myself inside a large gap in the middle of the group. The fast people are way ahead and the people who just want to finish are behind me. Mentally, I start willing myself to pick up my pace slightly to make up for my slower pace at the beginning – when everyone was so gung-ho to run. Some people are taking a little walking break, but I keep running. I start feeling proud of myself that my breath is controlled despite feeling some tiredness in my legs, ankles or knees. I’m nearing my mind over matter zone. As I see the marker for the last 2 miles (whether 10k or half marathon), my thoughts no longer focus on a little pain. I keep running – maybe kicking up my feet to stretch out my knees and quads or extending more through my hip flexors. At that last mile, I put on my boosters. I’m thinking – I only have 1 more mile! I need to make it count! I’m almost there! My stride and pace change with my somewhat crazy focus and last-mile intensity. I start to breath a little harder because I am racing myself to the end. Why have I decided to race myself? I used to be happy to be half-assed! I don’t know what it is exactly – maybe it’s the endorphins, the runner camaraderie or that I ran my best half last weekend in Philly and my best 10k at Roosevelt Island yesterday. Those time improvements are definitely motivational and they may be short-lived – but I know I like it. And I want to keep doing it. So, no more half-assed for me.